Some of the best popular science books are the ones that change your way of looking at something. They might show you, for instance, that time travel is real, not just science fiction, or that quantum theory is not just for Nobel Prize winners – or, in this case, that our whole attitude to invasive species is down to emotional knee-jerk response, not to real science. 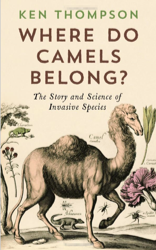 Ken Thompson’s fascinating and highly readable book takes us on a tour of the way that ecologists have made invasive species public enemies without any good basis. He shows how it is very difficult to say whether a species is native or alien, and whether this matters. Often, it seems to come down to whether we like the species or not. He shows how many of the invaders we panic about actually improve species diversity, how it’s a perfectly natural thing for species to move from place to place, and how bad science means that ecologists confuse correlation and causality – a classic scientific error. This is an important and thought provoking book that deserves widespread exposure. At risk of hyperbole, I’d say it is to ecology what Darwin’s Origin of Species was to evolution. Not because it’s as important as Origin, but because like that book, it shows us a piece of biological theory that is entirely obvious and logical once you see it, yet it’s one that most of the people working in the field simply haven’t acknowledged or noticed. Highly recommended, and without doubt one of the best popular science books so far in 2014.